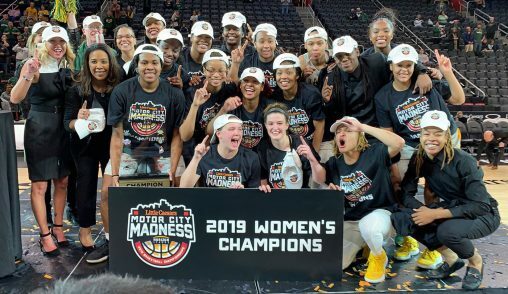 The Wright State women’s basketball team will host an NCAA March Madness Selection Show party Monday, March 18, at 6:15 p.m. in the Atrium of the Student Union. The Wright State community, alumni and public are invited to join the Raider players and coaching staff as tournament brackets are unveiled for the annual, three-week event to crown the national champion. The pep band, and cheer and dance teams will also be on hand to celebrate, and the University Bookstore will be open for fans to purchase championship merchandise. Snacks and beverages will be provided by Chartwells. Ample parking is available in front of the Student Union. The Raiders will learn their first-round tournament opponent when the NCAA announces selections on ESPN beginning at 7 p.m. First-round games will be played March 22 and 23 at campus sites located around the country. The Raiders won the Horizon League basketball championship on Tuesday with a 55–52 win over Green Bay. That victory comes on the heels of also winning the regular season title, the program’s first outright championship. Raider fans wishing to attend the NCAA Tournament run are encouraged to visit WSURaiders.com for ticket information.